recounting their aid trip to Gettysburg. copies today have sold for over $1,000. 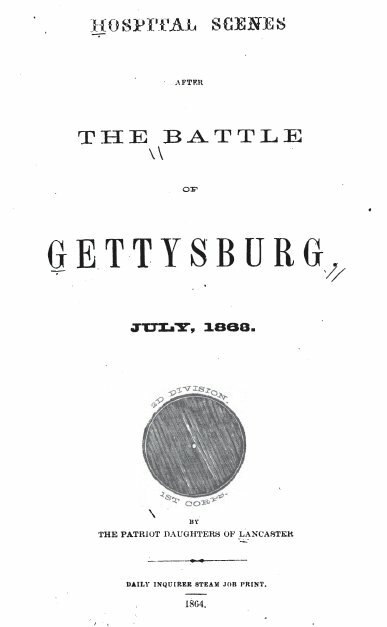 An advantage to studying the Civil War is that essentially all primary sources are part of the public domain, which basically means copyright has expired and the works are available for use by anyone. Since this includes books published before 1922, it is now possible through Google Books to view and download many books relevant to the 79th Pennsylvania and Lancaster County in the nineteenth century. Additionally, Google provides full-text searchability which makes research queries possible that probably couldn't have been dreamed of ten years ago. For instance, by typing in "Henry A. Hambright" and setting a couple search parameters, I can see just about every time the regiment's colonel has appeared in print. I have begun assembling my own small virtual bookshelf of public domain books related to this blog, so I invite you to check them out here: Google Books: Lancaster at War. "The Patriot Daughters Of Lancaster, Hospital Scenes After the Battle of Gettysburg (Philadelphia: 1864), pp. 54-57. The original book printed in a limited edition did not make mention of the authors name. This has led to confusion over the years as to her identity. An Obituary notice in the Star & Sentinel for July 22, 1875 makes it clear however, that Martha A. Ehler was the author."